The Sukhothai Historical Park encompasses the "old" walled city of Sukhothai as well as the outlying temples around it. The inner city was enclosed by a concentric set of earthen walls. There are around a dozen or so major monuments within the inner city, including the Ramkamhaeng National Museum, which houses many of the smaller artifacts found around the old city. Click on the text or filled areas to see more information about the sites. Unfortunately, most people visit Sukhothai as part of a group tour that stops in Sukhothai for an hour or so before moving on. However, if you're truly interested in Thai art or history, and traveling on your own, then Sukhothai is well worth a couple of full days. You can see the inner city and some of the outer sites on one day, and the other outer sites the next. The best way to get around, in my opinion, is by bicycle. You can rent them from several stalls outside the entrance, or from the park just inside the main entrance. The rental cost is just around 30 Baht (0.78 USD). 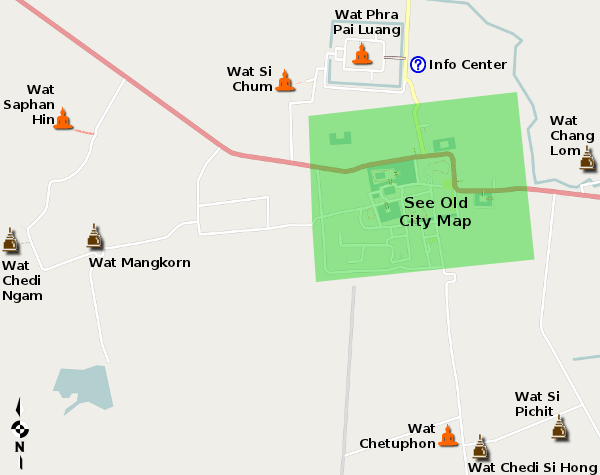 The logical place to start is Wat Mahathat in the center of the old city, then procede on to the adjacent temples such as Wat Sa Sri, Wat Chana Songkhram and the Ramkamhaeng Monument. The park has a rather complicated admission system. The sites are divided into five zones: the inner city, north, west, south and east sites. Admission to each zone is 100 Baht (2.60 USD) -or- you can purchase a pass to all five zones for 350 Baht (9.09 USD). However, the passes are only good for one day, so if you plan to spread your visits over several days, it's best to purchase admission when needed. The sites are basically open during daylight hours. There is a tourist information center north of the city, facing Wat Phra Phai Luang, but on my visit, there wasn't anyone there to serve the tourist. It is a beautiful building, with a good model of the old city and vicinity, but don't expect to find any detailed help there. During the "cool" season from October to April, a historical drama is performed at Wat Sa Sri. The performances are on the first Saturday of each month, and include a buffet picnic dinner. The performance is set against the brightly lit temple, and concludes with fireworks. It's quite a show.